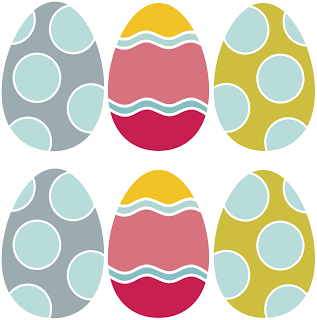 Make or print clipart images of non-matching Easter eggs. You will need at least 12-16 (for a total of 6-8 matches). Write numbers, song titles, lines from songs ("Whenever I hear the song of a bird" on one & "or look at the blue, blue sky" on the other), or keywords for songs on the back of each egg. Pictures representing the topic/keyword of the songs would also work. Lay them out on the table or tape them to the chalkboard. Have a child try to make a match. Whenever a match is made, sing the corresponding song. Easter "Do As I'm Doing"
I purchased these masks & ears from the Target dollar section, but I have seen similar items at Michael's. Make Easter action cards that say, "Hop like a bunny", "Peck like a chick", "Roll like an egg", "Gambol like a lamb", etc. Simply have a child draw a card & lead the rest of the children in "Do As I'm Doing" Easter style! Have him or her wear the mask or ears that corresponds to the card chosen. Place song titles in plastic Easter eggs & hide them around the room. Choose a child to find an egg. Sing the song inside. If you did not do the activity I posted for week 1, it would also work well for this week. See the post here. Another idea is to put the following scriptures in plastic Easter eggs. Each scripture contains a message that Christ taught. Have a child pick an egg and read the scripture. Have the child identify what the Savior taught us & discuss it with the group. Sing the corresponding song. Bear your testimony of the Savior, His life, and the Atonement. Testify that Jesus provided us with a perfect example to follow. He then gave His life so we could all be saved from sin. He is truly our Savior. Close by singing "He Sent His Son" (p. 57). One of Jesus' disciples asked Pilate if he could care for Jesus' body after He died. Pilate agreed to let him do this. Mary & Mary Magdalene wrapped Jesus' body in linen & used spices to preserve His body. They would return to do this again in a few days. A large rock was rolled in front of the tomb. The Pharisees asked Pilate to place a guard in front of the tomb...Jesus had told them that He would rise on the third day. They were afraid that the disciples might come & take the body to make it look like Jesus had risen. An angel of the Lord descended from heaven & rolled back the stone from the tomb. When Mary & Mary Magdalene returned, they entered the tomb & saw an angel of the Lord who told them, "Be not affrighted: Ye seek Jesus of Nazareth, which was crucified; He is risen; He is not here." Mary Magdalene ran to tell Jesus' disciples. They ran to the tomb & saw that it was empty. Jesus first appeared to Mary Magdalene while she was in the garden mourning. She turned & saw Jesus standing there, but she did not recognize Him. She thought He was the gardener or caretaker. Jesus called Mary by her name...she realized it was the Savior & cried, "Rabboni" (Master). Jesus asked Mary not to touch Him because He had not yet ascended to His Father in Heaven. He told her to go to the apostles & tell them what she had seen. Bear testimony of your love for the Savior, the resurrection, & the blessings we receive from it. Did Jesus Really Live Again? St. Patrick's Day is actually on Sunday this year!!! Here are some fun & simple ideas to incorporate the holiday into singing time. I found these mini hats at Harmon's grocery store but I have also seen them at various craft stores (JoAnn's & Michael's). Simply create a memory game by numbering the insides of the hats. Pictures representing the keywords of the songs you'd like to sing also work. Place the hats in rows on the table. Invite a child to try & find a match. When a match is made, sing the corresponding song. Create a rainbow on the chalkboard using various colors of crate paper. Assign a song to each color of the rainbow. Have a child come up & choose one of the colors off the rainbow. Sing the corresponding song. Since there's always a "pot of gold" at the end of a rainbow, provide each child with a gold treat at the end of singing time. Harmon's & Orson Gygi sell gold chocolate coins but they are kind of pricey. I have used Rolos in the past. A fun size bag of Skittles would also be cute (the colors of the rainbow). Whatever the treat, place it in a black pot (I found a plastic one at Target). I originally found this idea on Sugardoodle & it was a total hit. Find or make a pair of green shoes. Talk to a member of your primary presidency beforehand about wearing the shoes (Disclaimer: it will require dancing). Explain to the children that a Leprechaun has left a pair of magic dancing shoes. These shoes cause whoever wears them to dance. The better the children sing, the better the shoes work. Instruct the person wearing the shoes to start off dancing slowly...maybe just tapping their feet. As the children sing well, have the helper start to dance more quickly. When I did this, many of the children wanted to try wearing the shoes (especially the oldest boys). Use your discretion...this can be a lot of fun but has the potential to get rowdy! I found my shamrocks at JoAnn's. A clipart image will also work. Number the back of the shamrocks & assign a song to each one. Tape the shamrocks underneath the chairs throughout the room. At the beginning of singing time, have the children check underneath their chairs. 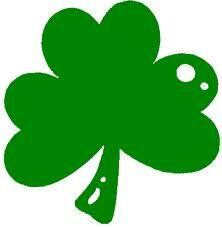 Have the "lucky" children with shamrocks come up one at a time to lead the song. Sing the corresponding song. I found all of these items at JoAnn's last year. Simply have a child wear the leprechaun mask or green glasses & lead the group using the "lucky" wand. *A fun way to determine who gets to participate during all of these games is to place shamrocks underneath the children's chairs. At the beginning of singing time, have the children check to see how "lucky" they are...those with shamrocks get to be the helpers during the chosen activity. This week's sharing time focuses specifically on the Atonement & Crucifixion. I have done the following activity several times & it ALWAYS invites the spirit. I am sure many of you have seen this before, but I feel that the best way to teach is often through repetition. Jesus introduces the sacrament at the Passover dinner. This is known as the Last Supper because it was Jesus' last supper before he was crucified. Jesus told his disciples what would happen that night & that one of them would betray Him. Jesus led his disciples to a garden of olive trees called Gethsemane. He asked Peter, James, & John to wait for Him nearby while He went to pray. While Jesus prayed, He "atoned" for our sins...He bled from every pour of His body because He was suffering for the sins of all people. After Jesus finished praying, Judas came with a group of men carrying clubs & swords. The Pharisees (Jewish leaders) paid Judas 30 pieces of silver to take them to Jesus. Judas showed them who Jesus was by kissing Him on the cheek. The men took Jesus & led him to the high priest. The high priest questioned Jesus. They hit Him & spit on Him. The next morning, the soldiers tied Jesus' hands & took him to the governor (Pontias Pilate). Pilate asked Jesus many questions & did not think Jesus had done anything wrong. The Pharisees told Pilate that Jesus should die. Pilate did not want any trouble withe the Pharisees so he told his soldiers to crucify Jesus. He washed his hands before the multitude saying that he found no fault with Jesus & that crucifying Him was their choice. Pilate's soldiers stripped Jesus & beat Him with whips. They put a red robe on Him & placed a crown of thorns upon His head. They mocked Him by saying "Hail, King of the Jews". They spit upon Him. Jesus was taken to a hill (Calvary) near Jerusalem to be crucified. They nailed Him to a cross. They put nails in His feet, hands, & wrists. Jesus prayed, asking Heavenly Father to forgive the soldiers who crucified Him because they did not understand that He was the Savior. About 3 hours after Jesus was nailed to the cross, the sky became very dark. The darkness lasted about 3 hours. Jesus' suffering was so great that it was almost more than He could stand. He cried out, "My God, my God, why has Thou forsaken me?" Jesus then said, "I thirst". Someone dipped a sponge in vinegar, placed it on a stick, & put it up to Jesus' mouth. In a loud voice, Jesus said, "It is finished. Father into Thy hands, I commend my spirit." Jesus bowed His head & His spirit left His body. He had accomplished what He came to earth to do...He had completed it on His own. The earth immediately began to shake. 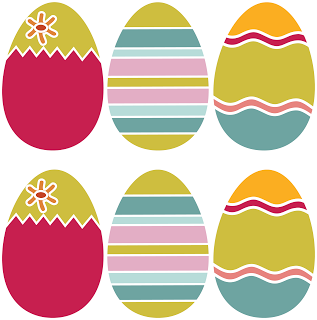 Invite a child (or two children on those with two eggs) to come up & open an egg. Discuss the objects & then sing a song of your choice. You can focus on teaching "If the Savior Stood Beside Me" or you can practice additional songs about the Savior as well. Close by bearing testimony of the Savior's atonement & His love for each of us. Another month, another song! I am so excited that "If the Savior Stood Beside Me" has been included in the program this year. I actually really like the ideas presented in the sharing time outline. Just be sure to coordinate with your primary presidency member to ensure that you don't do the exact same thing as they're doing for sharing time. 1. Use the "Do as I'm Doing Discs" found here or here. Invite a child to select a disc & then lead the group with the action he/she chose. Repeat the activity several times, each time inviting a different child to choose a disc. Explain that when we follow the actions of someone else, we are following his or her example. Present a picture of the Savior & explain that He provided us with a perfect example to follow. Begin teaching "If the Savior Stood Beside Me". 2. Select pictures of the Savior during his time on earth. Pictures should be those that illustrate His example to us (i.e., Christ being baptized, Christ praying, Christ teaching in the temple as a Child, Christ washing the feet of the disciples, Christ with the children, Christ performing miracles, etc). All of these pictures can be found in the LDS gospel library. Place the pictures on the board or in a sack/container the children can draw from. Invite a child to select a picture & then discuss what Christ is teaching us in the picture. Intersperse this activity with teaching of "If the Savior Stood Beside Me". Another variation of this activity can be found here. Close by bearing testimony of the Savior's life & the example he provided for each of us. I am Christie...a wife & momma of 3 who LOVES primary music. While it's a lot of work, I truly believe that the primary chorister is the best calling in the church. I have been so blessed & have gotten great joy from teaching the children in my ward. This blog is a compilation of my ideas...I hope you will find it helpful. Enjoy!